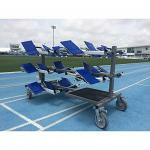 Compatible with almost any starting block, the Essentials Block Cart is the ultimate in functionality. Carries up to 10 sets of blocks. All steel construction with black lacquer finish. Dimensions: 52” tall, 38” long, 20” wide.